What follows are the top 10 Jasper athletes and moments of 2014, all in descending order. There were many contributors to Manhattan’s run to the MAAC Softball Championship game, but towards the top of the list is Elena Bowman. Bowman defined what a true slugger is, leading the team in most hitting categories. Some of her statistics were good enough to put her among the leaders in the MAAC. From the catcher’s position, Bowman led the MAAC in home runs with 13 and tied for second with 43 runs batted in. She received All-MAAC honors for her performance during the MAAC Tournament in which she hit .400 and had a .733 slugging percentage in six games. At the end of the season, Bowman was also recognized by being named to the All-MAAC Second Team. Bowman was Manhattan’s most feared hitter all season long and without her power and RBIs it is tough to tell what Manhattan’s season would have been like. Joey Rocchietti looks into his catcher to see what to pitch next. Photo courtesy of Joey Rocchietti. Rocchietti said early on in the season he focused on being better each time out on the pitcher’s mound with no weight put on his shoulders. He has felt differently about that mentality as the season has progressed. He said if there is one excuse for the Jaspers’ pitching woes, it’s that the staff is young and doesn’t have a lot of game experience. But the young pitchers are learning, developing and plan to help the team win in the future. Spoken like a true ace. Alex Shackley preparing his next move during the final game of the season against the Iona Gaels. Photo taken by Christian Jordan Roodal. 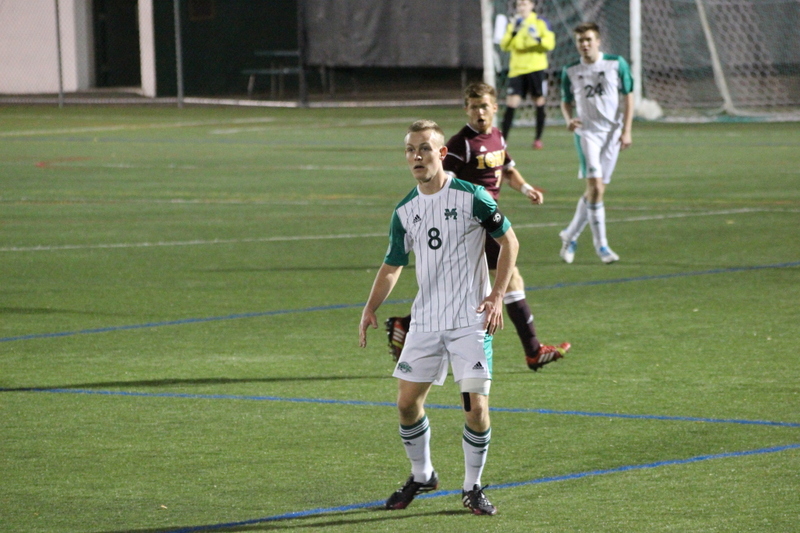 Shackley made MAAC All-Academic Team for a second straight year and led men’s soccer in points (8) and goals (3). This is shameless plug of his recent profile about what he means to his fellow Jaspers both on and off the field. Helping lead the Jaspers this season was junior goalkeeper Kristen Skonieczny. She tallied four shutouts and 75 saves along with a 1.22 goals against average. When in goal, she went 8-6-1 for Manhattan this season. After being named to the MAAC All-Academic Team last season, she was selected to the Capital One CoSIDA All-District First Team after the 2014 season. The award recognizes the nation’s top student athletes for their performances athletically and academically. Perhaps no Manhattan College athlete took a bigger leap from one season to the next than Malia McGuinness. While 2013 was a solid season for McGuinness, 2014 was a monstrous campaign. McGuinness posted 24 double-doubles in 34 matches and was Manhattan’s most dangerous player at all times. She led the MAAC in kills per set with 3.7 and placed 10th in digs per set with 3.54, making her the only player in the conference to land in the top ten in both categories. She was rewarded for her outstanding season by being named the MAAC Player of the Year, only the second player in Manhattan’s history to win the award. Her 2014 season will undoubtedly go down as one of the best in Manhattan College history. Freshman swimmer Alexandra Hutzler has started her Manhattan career on a red-hot stretch. In seven meets this season, Hutzler has won six Women’s Performer of the Meet awards. In just her first collegiate meet, Hutzler won three events, including the 100 breaststroke, the 100 butterfly and the 200 individual medley. In her second meet, she won first place and with a time of 2:30.94, broke a school record in the 200 breast, destroying the previous record by 6.06 seconds. Her third meet saw her break two more school records in the 100 breaststroke and 200 individual medley. As if that was not enough, Hutzler’s most impressive performance came on Nov. 15 when she broke four school records in a meet against Iona. Her 50- split time of 32.62 broke two school marks. In the 200 breaststroke, her 2:30.21 saw her take down a school record and she also broke the best mark in the 200 individual medley, finishing with a 2:13.71. Hutzler continues to win events and break records for Manhattan a stretch that will be hard to match by anyone in 2015. Senior forward Aislinn McIlvenny led the Jaspers with 10 goals and four assists in 2014, along with six game-winning goals. She was named to the Metro Atlantic Athletic Conference (MAAC) First Team, voted by the league’s 11 head coaches. She was previously named to the MAAC Second Team for two consecutive years. In addition, she earned a spot on the CoSIDA Academic All-District First Team for the second time and the Senior CLASS Second Team All-American. This award honors student athletes in the four areas of classroom, community, character and competition. If Elena Bowman is towards the top of the list of key contributors to Manhattan’s run to the championship game, she is only bested by Kate Bowen. 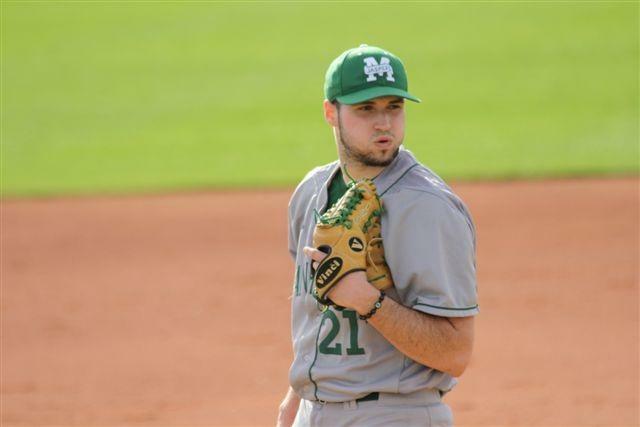 Bowen did it all for Manhattan in 2014, playing second base and pitching, and leading the team in several hitting and pitching categories. Her remarkable season in 2014, in which she hit .318, scored 41 runs, and had 12 wins to go along with a 3.60 earned run average, was rewarded with a plethora of accolades. Bowen was named to the All-MAAC First Team, received the ECAC Scholar Athlete of the Year award, was named Third Team Academic All-American and was nominated for the NCAA Woman of the Year award. Bowen defined what a student athlete should be, compounding her stellar 2014 campaign by being named Manhattan’s valedictorian. What’s not to love about Brown? While 2013 may have been Brown’s more dominant year, 2014 was still one of the best for Manhattan’s big man. His offensive numbers don’t pop off of the sheet: just 10.1 points per game and 5.9 rebounds last season. But his play on the defensive end is what made Brown one of the best big men in the MAAC. Last season, Brown was third in the nation in blocked shots per game with 3.76. He was the only player under 6 feet 10 inches to finish in the top five. Brown also became the Division I active leader in career shots blocked as well as second all-time in MAAC history. He was already Manhattan’s all-time leader before the season started. To cap it all off, Brown helped his team win its first MAAC championship in 10 years. He scored 15 points in the championship game against Iona and was named to the MAAC Championship All-Tournament team. No Manhattan College athlete had a more successful 2014 than George Beamon. Beamon led his team in scoring averaging 18.8 points per game and 6.5 rebounds per game, while his defense stifled opposing guards throughout the season. He was named First Team All-MAAC for his regular season performance. Beamon led his team to its second consecutive MAAC championship appearance. The previous season, Beamon was forced to watch from the sidelines with an ankle injury that kept him out for most of the season. This season was different, as Beamon led the Jaspers to its first MAAC Championship in 10 years. His 16-point, eight-rebound performance on the big stage earned him the Most Outstanding Player award. Beamon also moved up to fourth all-time on the Manhattan scoring list, just 203 points away from leader Luis Flores. Before the season, Flores – who was drafted by the Houston Rockets in the second round – said that Beamon was a more complete player than he was in college. After the season concluded, Beamon was drafted by the Oklahoma City Blue in the third round of the NBA Development League draft. Beamon was the only player from the MAAC drafted into the D-League last season, and the first since 2012. Beamon will be a lock as a first ballot for the Manhattan College Athletic Hall of Fame when he becomes eligible in 2024. His accomplishments and winning legacy have put him in an elite class of Manhattan College athletics not just for 2014, but all-time. Chris Kalousdian up at bat. Photo courtesy of Chris Kalousdian. Head Coach Jim Duffy said the team is learned and is already looking forward the coming season. There wasn’t one empty seat in Draddy Gymnasium on this cold, winter night. In fact, finding good standing room along side the bleachers was difficult. It was a typical Manhattan-Iona matchup. With just nine seconds remaining in a tie game, Iona’s Tre Mason weaved his way to the rim in what seemed like an easy layup until Emmy Andujar rejected his shot. Andujar would dash down the court for the game-winning layup, but fell just short. For the second time in three meetings, the game between the cross-town rivals went to overtime. In overtime, Andujar scored five of his team’s nine points. With the game tied at 73 with just under three minutes, Andujar stole the ball, scored a fast break layup and drew a foul, giving the Jaspers the lead for good and rocking the packed house in Draddy. Manhattan won 80-77 as Andujar stole the show, finishing with 28 points, six rebounds, three assists and three steals off the bench. Iona still had the first seed locked up, but the win was a turning point for the Jaspers. Manhattan would not lose again in the regular and postseason after the victory against Iona, resulting in its first MAAC Championship in 10 years. “We let people know we’re still the team to beat,” Andujar said after the win against the Gaels. Paul Toohey lines up at the Puerto Rico 12th green championship course. Photo courtesy of Toohey. It was a golf season full of inconsistencies for the Manhattan Jaspers until the end when the Jaspers were a mere four strokes shy of winning the MAAC title. Captain Chris Calabro liked the effort the team gave, but it wasn’t enough to win the MAAC championship. The Jaspers finished in fourth place, which is the best the finish at the MAAC tournament since 2001. The team placed one stroke behind Fairfield and Monmouth, who both tied for second place, and were three strokes behind the winner of the MAAC title St. Peter’s University, who had a three-day score of 931 (+67). Despite unsatisfying finishes to their college golf careers, Calabro, Jonathan Feuer and Paul Toohey sense the Jaspers’ top tier finish at this year’s championships is an experience that made veterans out of James Edgeworth and Michael Giannico. Andrew Santos prepares to kick a long ball downfield behind the defenders of the La Salle Explorers. Photo taken by Kevin Fuhrmann. The Manhattan Jaspers found themselves looking up at every other school in the MAAC after failing to win 12 straight games from early September to late October. Next thing they knew, they were on the team bus taking a 14-hour round trip to take on the Niagara Purple Eagles in cold, freezing temperatures with a rain and snow mix falling. To this point in the season, the offense was inconsistent. They went through a 587-minute goalless streak in a span of six games and followed that up with only three goals in the five games leading up to Niagara. During these struggles, Jaspers’ head coach Jorden Scott had a conference call with his coaching staff. “Stay bright, stay positive around the guys. Keep working with them. Do extra sessions, do extra work, do extra video,” he told them over the phone. 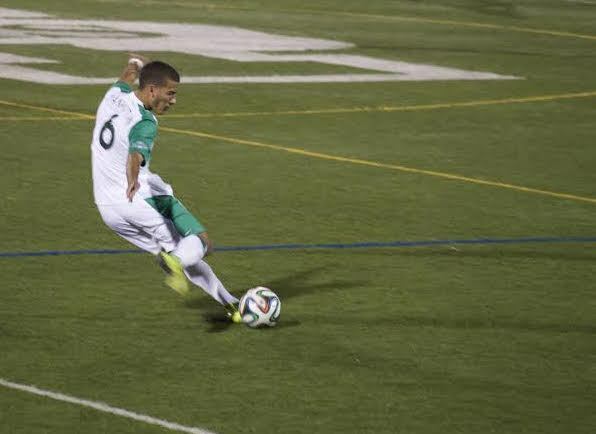 After the final whistle blew at Niagara, the Jaspers finally started to put things together. They scored five goals, a season and game-high. Alex Coates McDowall also recorded his third clean sheet of the season. Along with McIlvenny, freshmen Nicole Aylmer and Emily Center earned MAAC honors, being named to the All-Rookie Team. Center has started in all 18 games she’s played in and a shooting percentage of .600. Aylmer has started in the 13 games she played in and averaged three shots per game. On Selection Sunday, all head coach Steve Masiello could do was shake his head when he saw his old team, Louisville, pop up next to Manhattan for the second round matchup. The Jaspers were traveling to Orlando to take on the defending national champions. Masiello was an assistant coach under Louisville head coach Rick Pitino and adopted a near identical style of up-tempo, full-court press, in your face basketball that Louisville also plays. Everything Masiello knew came from Pitino, who would now be on the opposing sideline. The Cardinals came into the game playing its best basketball of the season, winning 12 of the last 14 games. Louisville was also coming off an Atlantic Coast Conference Championship where they won by an average of 33 points in the three tournament games. Manhattan looked like just another victim in Louisville’s way. But through 30 minutes in a close game, it became clear that the Jaspers were not only playing with the defending national champions, but they also had a chance to beat them. In a tie game with 2:35 remaining, Tyler Wilson drove to the rim for an easy layup and the Jaspers had the lead for just the second time in the game. More importantly, the Jaspers were just 2 minutes and 35 seconds away from knocking off the defending champs and shocking the country. But the Cardinals responded. Wayne Blackshear tied the game up, then Luke Hancock scored eight straight points, including back-to-back 3-pointers that all but sealed the Jaspers’ fate. Manhattan went on to lose 64-71, but it was a memorable game without question. Masiello nearly knocked off his maestro, and the Jaspers nearly upset the Cardinals. The 2014 season for Malia McGuinness was filled with moments worthy of making this top ten list. Any one of her 20-20 performances, especially the 20 kills 27 digs performance which led Manhattan to its first victory at Iona in over eight years could have cracked the list. The day she became the fifth player in Manhattan history with 1,000 kills and 1,000 digs or even Senior Day could have been her defining moment. But the highlight of her season came after the season ended. McGuinness was named MAAC Player of the Year, becoming only the second player in Manhattan’s history to win the award. McGuinness led the conference in kills per set and was 10th in digs per set, making her the only player in the conference to be in the top ten for both categories. She also notched 24 double-doubles in 34 matches to go along with several 20-20 performances. However, despite her eye-popping numbers, Manhattan could not take advantage of having the MAAC’s best player on its team, getting eliminated in the semifinals of the MAAC Tournament for the second consecutive season. It’s a shame it played out that way, or else a run to the MAAC Championship game, not an individual performance by one of its players would have made the list. It’s rare to see freshmen in any sport dominate the competition. But don’t tell that to Alexandra Hutzler. The freshman swimmer has begun her collegiate career winning almost every event in which she has participated. The highlight of her short collegiate career is one that takes most swimmers their entire career to accomplish. On Nov. 15, in a meet against Iona, Hutzler won two events and broke four school records. With a 1:08.99 mark in the 100 breaststroke, she won the event by over one half second. Her 50- split time of 32.62 broke two school records in the event. In the 200 breaststroke, she finished with a 2:30.21 to win by 5.02 seconds and in the meantime break a school record. Finally, her 2:13.71 mark in the 200 individual medley also broke the school best. At her current pace, it looks like Hutzler is poised for more memorable moments in 2015. Coming into the MAAC Softball Championship as the sixth seed and with a 22-27 record, there weren’t many expectations for Manhattan’s softball team. After dropping its first game of the tournament and entering the loser’s side of the bracket, one more loss meant Manhattan would be eliminated. 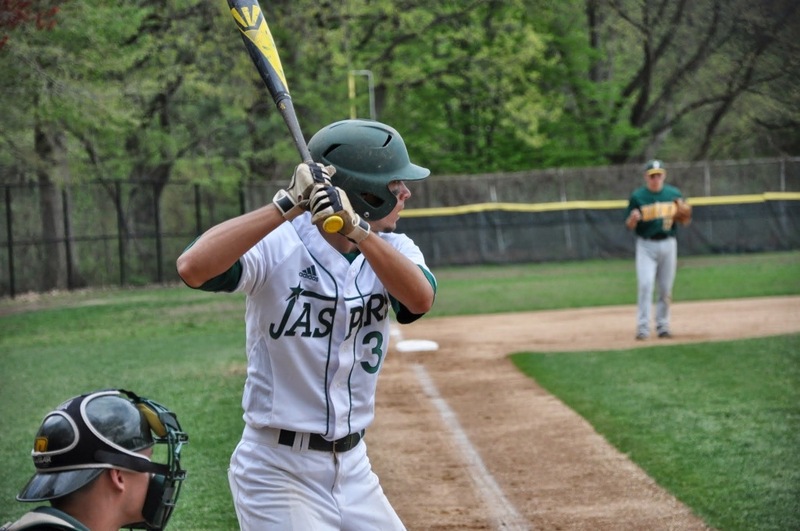 The Jaspers staved off elimination with a win on Friday, May 9, but remained in the same situation heading into Saturday. But as is usually the case in tournaments in all sports, when teams catch fire at the right time, they are hard to beat. That is exactly what happened with Manhattan, which won three consecutive games on Saturday to make a run all the way to the MAAC Championship game. All three games were decided by one run, with the final two resulting in 1-0 victories by Manhattan. The phenomenal stretch by Manhattan meant it would be battling for a MAAC Championship for the first time in 15 years. Ultimately, Manhattan’s run would fall short in the championship game, where it lost 8-0 to Iona, but in no way does that heart-breaking defeat take away from the impressive run it took to get there in the first place. Just 10 days after Manhattan defeated Iona in Draddy, the Jaspers would have to defeat the Gaels again. This time, it was on the big stage: the MAAC championship in Springfield, Massachusetts. The Jaspers hadn’t defeated the Gaels twice in one season since 06’-07’, and the Gaels were the back-to-back MAAC champions. None of that mattered on the Monday night between the two rivals. After a 3-pointer by George Beamon gave the Jaspers a 10-point lead with just 6:25 left in the game, the lead and the momentum seemed too large for the defending champions to overcome. The Gaels, however, went on an 8-2 run following an Iona timeout to put the game in reach. With a two-point lead for the Jaspers, Donovan Kates went to the line after being intentionally fouled with just 17 seconds remaining. He made the first and missed the second, setting the scene for yet another memorable finish between the two rivals. A.J. English dribbled the ball by the 3-point line where he found an open David Laury. Emmy Andujar sprinted toward Laury and contested the 3-point shot that went off the side of the rim, and the Jaspers won its first MAAC championship in 10 years. Beamon led all scorers with 16 points to go along with eight rebounds, earning him MVP honors. The victory was the culmination for coach Steve Masiello, who helped the Jaspers improve every season since he became head coach. Editor’s Note: Honorable mentions that didn’t make it into the top Jaspers were junior golfer James Edgeworth, junior transfer point-guard Jacqui Thompson and senior forwards Ashley Stec and Shayna Erickson. And for moments the lone hold out was women’s baseketball’s Canadian Exhibition.